What's this? Whilst in London for the Next Beauty event, I just had to check out the new(ish) Charlotte Tilbury boutique in Covent Garden! It was so so beautiful (see this Instagram pic!) and I couldn't resist trying a few products out. I got matched to the Magic Foundation (I've definitely got my eyes on that next!) and tried out the Ecstasy blush. I've not tried any of Charlotte's blushes yet (probably one of her few products I've not tried -woops! ), so I thought I'd try one out. I chose Ecstasy as it seemed the most 'me' shade, that would go with most makeup looks. And it turns out, Ecstasy is their best selling blush shade! Where can I get it? This blush is £30 and you can get it from the Charlotte Tilbury site, John Lewis and Selfridges. Swatches? See below! 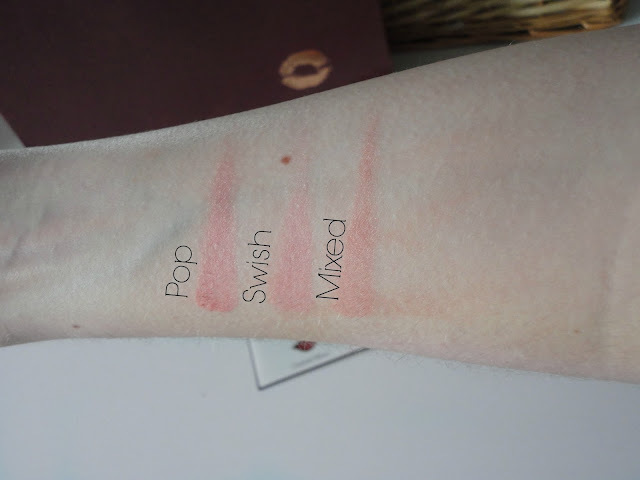 I've included a swatch of the outer shade (the 'swish' shade) and the inner shade (the 'pop' shade) and then them mixed together so you can see the differences. The Pros... This is definitely the kind of blush I was looking for! A nice peachy pink that looks natural on the cheeks but still adds a bit of colour. As you can see from the swatches, you almost get 3 blushes in one as you can go for something lighter or darker as you wish. It's super pigmented - but then I expect nothing less from Charlotte Tilbury and applies onto the skin really nicely. Obviously, the packaging is just beautiful - really sturdy and it even has a little mirror too. The Cons... I really don't have any cons for this - it's so amazing! Yes, it's pricey (which I suppose could be a con really...), but so so worth it for a good quality blush that I'm using pretty much daily! My only thing would be that you have to be super careful when applying as it is so pigmented that you have to be careful not to end up with bright peachy pink cheeks! What do you think? Have you tried this? Let me know if you have, and what you think of it in the comments!